Here’s your chance to make an important contribution to education at L. Thomas Heck Middle School—and receive a lot of credit for your generosity and community spirit. Of course, we’ll lavish you with thanks and praise, but there’s something you may find even more rewarding. An Arizona state tax law (ARS 43-1089.01) allows individual taxpayers a tax credit of up to $400* (per return) on Arizona Income taxes when they make a financial contribution in support of extracurricular activities in any public school. The kinds of programs you can help fund range from sports and band fees to lab sciences and art projects. L Thomas Heck is committed to maintaining these activities for the enjoyment and enrichment of our students. Unfortunately, our funding is not sufficient to offset all of the associated costs. As a result, these programs must depend on fees from students. And that’s where you can help. The tax credit is available to all individual taxpayers in the state of Arizona, regardless of whether or not they have children enrolled in public schools. Contributions from businesses are always welcome and tax deductible under federal and state law. However, such contributions cannot be used by businesses to obtain a tax credit. The credit may be claimed on personal income tax returns only. To claim your Arizona state tax credit, just make a donation in an amount you feel comfortable contributing. Whatever amount you give will be offset by a dollar-for-dollar tax credit for the applicable tax year—up to $400* per tax return! The schools and programs you support are entirely your choice. The law simply states that your donation must go directly to a local school to be used for its extracurricular activities. It’s that easy! Write a check to the school(s) of your choice, and get a receipt verifying your donation to an extracurricular activity. Then, next spring, simply claim your tax credit—up to $400*—when you file your tax return. Eligible contributions under this plan go directly to local schools—not to the state, not even to the school districts. And the funds are not subject to the revenue control limit that prevents schools from spending more than a fixed amount for programs. Your donation will go exactly where you want it to—immediately helping more children become involved in fun, meaningful, and life-enhancing activities. And, in the process, it will make more funding available for academic programs. 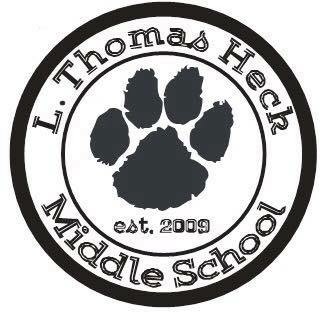 L. Thomas Heck Middle School is planning now for this year’s activities. Your timely contribution can make a big difference in a young person’s life by providing fun, worthwhile activities in a safe, supervised environment. With our expanding student population, funding for extracurricular activities has never been more critical. And with the tax credit program available, giving has never been more logical or attractive. In order to take advantage of the tax credit contribution for the 2017 tax year, you must make your contribution by **April 15th, 2018. Thank you for your generous contributions that help students become active in meaningful and rewarding activities. Contributions can be done online or print out a form and drop off at the school.